We specialize in lot master planning and full residential site development. We will guide you through a step-by-step process from concept to construction. When introduced to the owners, they were in the midst of building a home on a side hill overlooking the Elbow River. They were considering a number of vertical wall proposals to address the landscaping in the 6 meter cut at the back of the house. 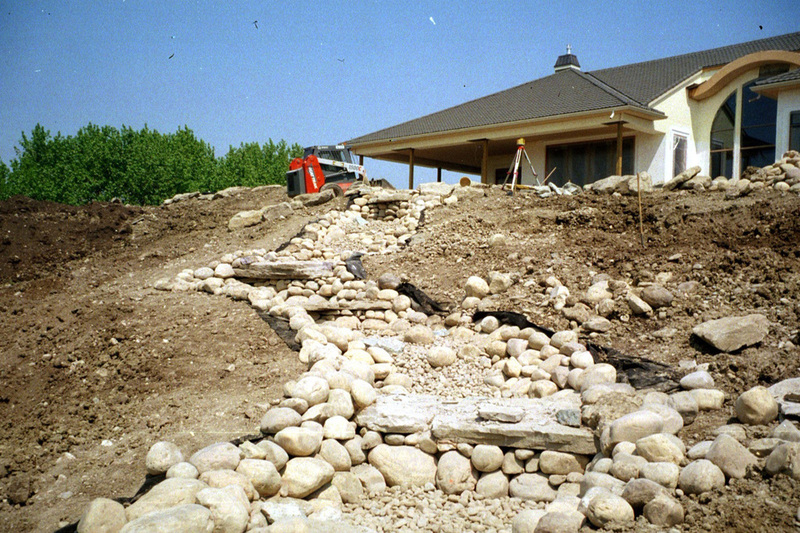 SCOPE proposed a stepped wall using large structural rock in order to open the space behind the house to more sun, provide large planting areas for attractive trees and shrubs and open the site lines to more areas of the attractive acreage. 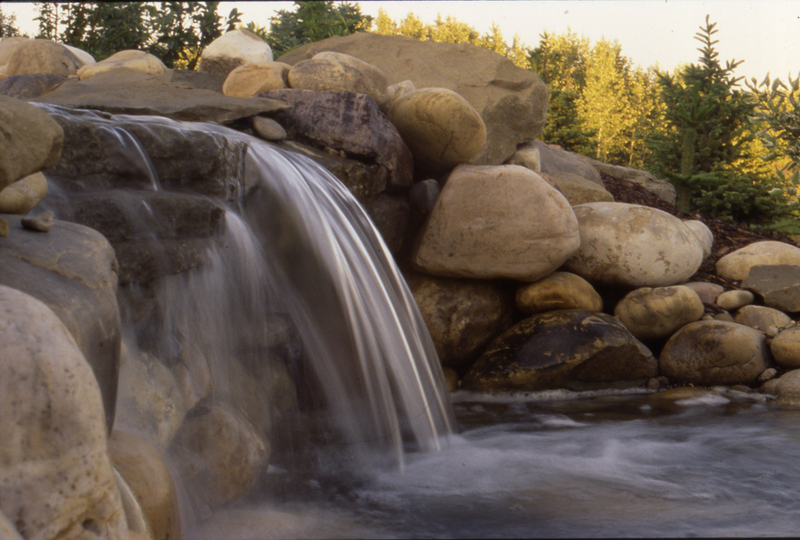 The large boulders and limited working area created numerous logistical challenges but the success of the project resulted in the contract to design and landscape around the entire residence. The new residence was under construction on a lot 15 meters above and overlooking a lake. 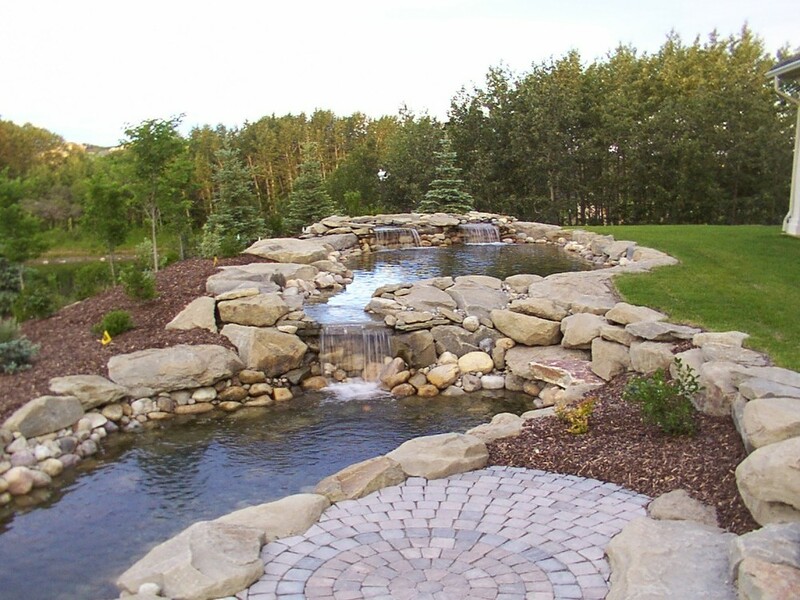 The assignment was to design and build a water feature involving a narrow back yard, then course 40 meters down a relatively steep slope to a lake rich in nutrient loading. 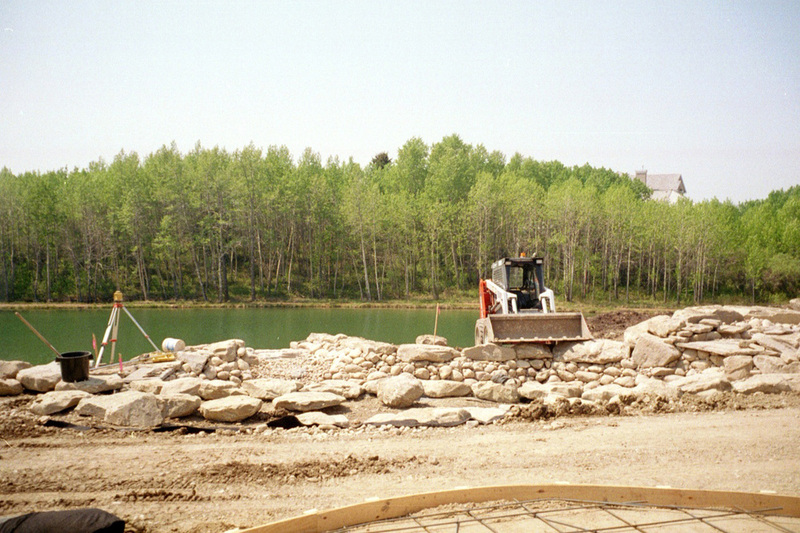 SCOPE worked with “a hands on owner” to develop a design involving twin ponds, three waterfalls and a bio-filtration system at the top off the rear decks, which then courses down over a number of waterfalls, through a constructed beach to the lake. The circulation system involved a multi-stage vertical lift turbine operated by a state of the art VFD technology and single phase to three phase electrical conversion. 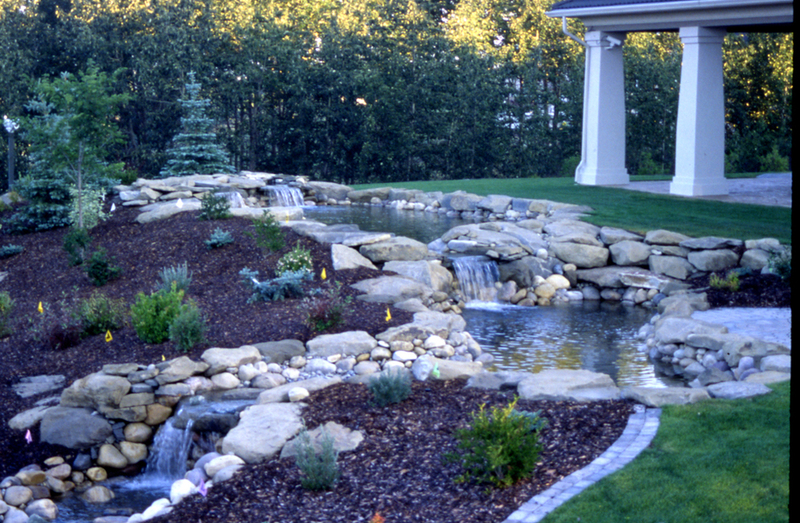 The finished landscape was featured in a stylish home magazine popular in the Calgary region. 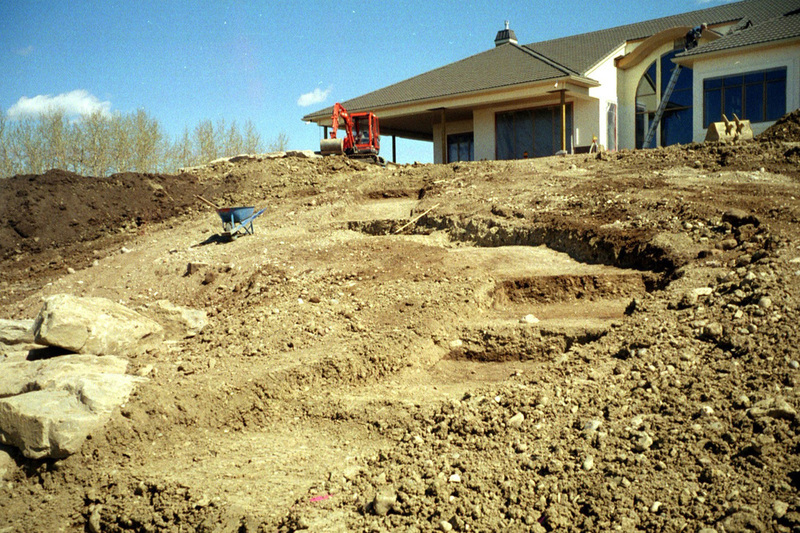 SCOPE was retained as the Landscape Designer on the project and worked closely with the home builder and owner to submit and obtain all necessary permits through the City of Calgary. In the midst of the home construction the owners were devastated along with many other Calgarians by the 2013 floods. By the summer of 2014 after a long cleanup and rebuilding process we were able to create a landscape that rivals most projects in the city. The home development was a LEED Silver project and as such had a variety of underlying factors to make the home as efficient as possible and meet the LEED Silver standard. The landscape included a state of the art irrigation system, green roof, permeable paving areas, swimming pool and much more.